When you think of haute perfumery, you think of Van Cleef & Arpels; a name synonymous with refinement, excellence and absolute luxury. The jewellery house began a new chapter in its history with the launch of their first fine fragrance in 1976, and then revolutionised the perfume industry with the release of the haute parfum Feerie in 2008. 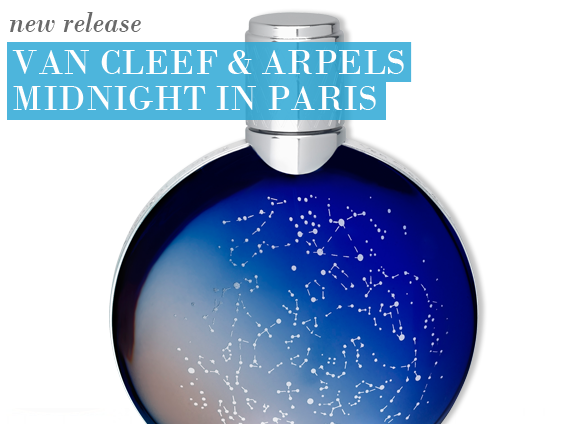 Van Cleef & Arpels begin yet another chapter this year with the release of brand new fragrance Midnight In Paris: this time taking men’s fragrances into the era of haute parfumerie. Based around the eponymous watch from the design house’s ‘Poetic Complications’ timepiece collection, the unique constellation bottle is inspired by the beauty of the midnight sky over Place Vendome in Paris. The graduated dark blue bottle is shaped like that face of a watch, with a silver rim displaying the Midnight In Paris logo, whilst the cap is reminiscent of the dial of the watch, monogrammed and ergonomic. Midnight In Paris is a luxury lover’s dream scent. Available in both an Eau de Toilette and an Eau de Parfum, it is a poetic homage to the mysterious and fascinating Cosmos, faceted like a rare timepiece. An opening of sparkling citrus fruits explode like constellations across the sky with a masculine touch of aromatic Rosemary and clear, sweet Green Tea, whilst the deeply resonating scent of leather begins to emanate from the soul of the fragrance. Devoid of innocence, Lily-of-the-Valley is darkened by the inkiness of Styrax and Lapsand Souchong. At its leathery base, an overdose of Tonka Bean, Benzoin and Incense seal a distinguished signature trail. Es bastante extraño, pero posee algo mágico y oculto que es invisible durante la primer testeo y en el intento conciente de saber qué notas posee. Esta fragancia hay que disfrutarla casualmente; aplícate una gran cantidad en la piel y deslumbrarás. Creo que lejos lo mejor es la nota a limón. Me gustaría que el Té fuera más intenso, algo similar a Gucci pour homme II. This entry was posted on Friday, October 15th, 2010 at 8:10 am and is filed under Fragrance, Men, New products. You can follow any responses to this entry through the RSS 2.0 feed. You can skip to the end and leave a response. Pinging is currently not allowed.